The team at Titus Contracting is excited to work on office remodeling project for one of their favorite local non-profit organizations, the GraceLyn Group. The project focuses on converting a two-car garage into two new offices and a day room. This office remodeling project is taking place in Apple Valley, Minnesota. We’re excited to share a few of the details with you! The GraceLyn Group provides a variety of services for those who have disabilities in creating healthy, safe and fulfilled lives. Some of these services include supportive living, remodeled with in-home family support, behavioral strategy assistance, and supportive employment services. GraceLyn Group has a residential living home called the Koinonia House. The group home is for teens and young adults with a variety of disabilities. The home provides a supportive environment and staff-administered needed care. For more information about the GraceLyn Group, visit www.gracelyngroup.org. If you would like to make a donation to the GraceLyn Group, you can contact them by email at info@gracelyngroup.org. As we stated above, we’re turning a two-car garage into two offices and a day room. 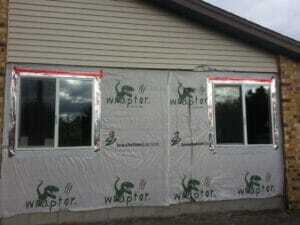 We’re adding new windows, doors, carpeting and laminate flooring. To complete the project, we had to install a block where the old garage door was located and frame in the opening, and then frame all the walls for the offices and day room as well as frame a floor to create a warmer space. We’re wiring the space and adding a new furnace and air conditioning systems. The floor and ceilings will be insulated and all inspections completed. Then we sheet-rocked the walls and ceiling. At the end of the day, we’ll add some paint and trim to the walls for a clean and polished look. We’re excited about the progress of this project. We also specialize in office spaces that focus on the Millennial generation. They have unique preferences and value a business that cares about them.